Crafted in platinum, this sparkling ring indulges in 3/4ct of classic diamonds. A pear cut diamond is framed with a halo of diamonds and set on diamond set shoulders. Striking and radiant, this ring is perfect as a luxurious engagement ring. 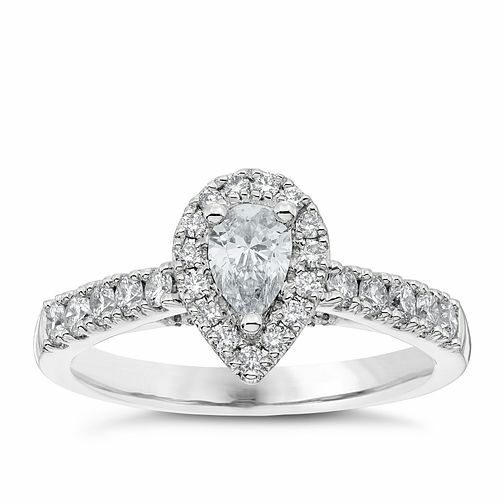 Platinum 3/4ct Diamond Pear Cut Solitaire Ring Halo Ring is rated 4.5 out of 5 by 2. Rated 5 out of 5 by Anonymous from Absolutely stunning This ring is amazing, I love the way there also stones under the top stone, actually on the band. The ring is alot more stunning in person that the images sometimes show online. 100% would recommend.... And she said yes. Rated 4 out of 5 by Anonymous from Beautiful ring My fiance chose this ring for me and it is absolutely stunning! The additional diamonds that sit in the band under the pear drop really make it a unique design. Be aware that due to the shape of the actual band not being a perfect circle, but coming together with a slight point at the top, this makes the fit of the ring a bit bigger than you think and so I had to have mine sent away and reduced by half a size so it would fit. For this reason I would not give it 5 stars. However, I have had it for 6 months now and have had no problems with regards to wear and tear, it is very sturdy!